The instrument comprises a recessed cover leaf hinged to a main box with a suspension ring. The sides are decorated with oak-leaf engraving and the underside has strapwork and foliate decoration. The outer face of the cover carries a lunar and horary volvelle. The fixed outer scale of hours runs 1 to 12, 1 to 12 and each hour is divided to 1/4. The outer scale of the disc is a scale of hours 1 to 24 divided to 1/4 for converting from equal to Italian or Babylonian hours. Next is another scale of equal hours 1 to 12, 1 to 12. The next circular band carries the inscription 'INDEX DIERVM AETATIS LVNAE' and is cut away to reveal a scale for the age of the moon. A circular aperture in the disc reveals a graphical representation of the age of the moon and the centre of the disc is occupied by an aspectarium with polygons and symbols for trine, quadrature and sextile. In a scroll beyond the fixed scale is engraved 'MERIDIES' and each of the two remaining corners of the face is filled with a putto. The inside face of the cover carries a table whose title incorporates the signature of the maker: 'QVANTITAS DIEI ET SINGNA [sic] ZODIACI AD ELEVATIO: POLI XXXXVI GRAD [star] VS [star] 1572 [star]'. The latitude seems to have later been altered to indicate 44? rather than 46?. The table gives the day of the month and the degree of the corresponding zodiac sign for one hour increments of the length of the day. The only exception is when 34 appears in the hour row for 12 June (12? Cancer); this evidently represents the longest day of 15 hours 34 minutes. The opposing face has a horizontal string-gnomon dial with a decorated folding brass gnomon support. The support is sprung to the vertical and incorporates a plummet. The silver hour plate may be a replacement; the numbering of the hour lines which run 4 to 12 to 8 and are divided to 1/2 appears more recent. There is also a faint inscription 'Pol 441/2'. That the instrument was later adapted for a different latitude than its original 46? 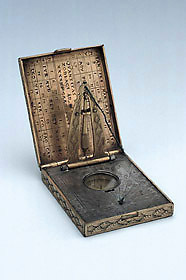 is also suggested by the presence of two holes in the gnomon support as well as by the compass set in the dial plate. The compass is 17 mm in diameter and is marked with a cross for the four cardinal points 'S', 'OR', 'M' and 'OC'. There is a line indicating a slight variation to the east and another heavier (and presumably later) line marking a larger westward variation. Provenance: Lewis Evans Collection G. 382.